Product information "SRAM Groupset XX1 Eagle - DUB 1x12-speed - black"
Sram built the incredible new XX1 Eagle™ drivetrain to work quietly, intuitively, precisely and perfectly. Whether you're an hour and twelve minutes into a World Cup XC or, just about to hit the top of Pearl Pass—XX1 Eagle™ is ready for that and every place in between. This cross-country-optimized drivetrain combines our newest generation of SRAM 1x™ drivetrain technological advancements with lightweight materials. With a greater gear range of 500-percent, XX1 Eagle™ gives you smoother, more precise shifts with greater durability for long lasting performance so you can spend more time in the gear you want. XX1 Eagle™ just rewrote the rules of freedom. New Grip Shift mechanism takes SRAM's original invention to an increased level of precision and durability. MOUNT OPTIONSNew improved B-Bolt attachment improves RD durability and consistency. X-SYNC™ 2 chainring design increases chain retention, wear life, and reduces friction and noise. 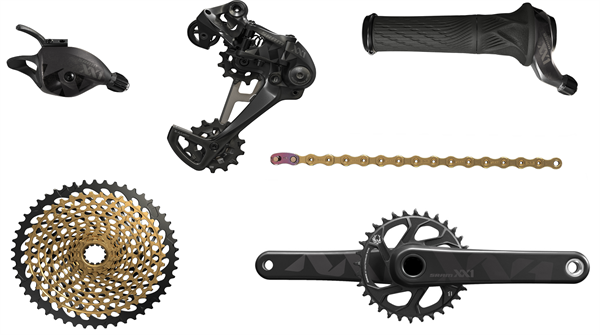 Related links to "SRAM Groupset XX1 Eagle - DUB 1x12-speed - black"
Customer evaluation for "SRAM Groupset XX1 Eagle - DUB 1x12-speed - black"